Sick Ship Sets Dubious Record For Royal Caribbean : The Two-Way Nearly 700 passengers and crew fell ill aboard the MS Explorer of the Seas — more people than any other cruise ship monitored by the CDC in the past two decades. 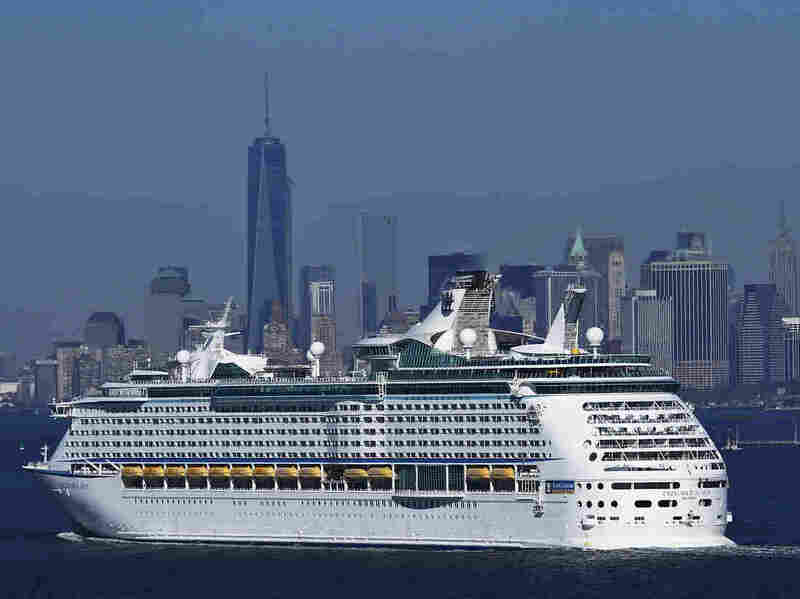 The New York skyline is seen in a distance as Royal Caribbean's Explorer of the Seas enters New York harbor on Wednesday after a massive ship-borne outbreak. It was a record-setting voyage, but not one that Royal Caribbean's public relations team is likely to be bragging about: The cruise line's MS Explorer of the Seas now has the distinction of more sick passengers (630) and crew (54) than any cruise ship since the CDC starting keep stats 20 years ago. The scenes aboard ship were of a fantasy cruise gone awry. Passengers who were supposed to be spending their days lounging on deck instead suffered bouts of vomiting and were confined to their cabins. On Sunday, a team from the Centers for Disease Control boarded the vessel to investigate during a U.S. Virgin Islands port call. The 10-day voyage that departed New Jersey last week was forced to return from the Caribbean two days early. Kim Waite of London told The Associated Press that she thought she was the only person who'd taken ill, only to be wheeled into the ship's infirmary packed with sick passengers. "I started crying, I couldn't believe it," Waite said. "I was in shock." Royal Caribbean says the ship will be sanitized and no one will be allowed aboard for a period of more than 24 hours as an extra precaution. It is scheduled to sail again on Friday for a nine-day trip to Puerto Rico, St. Thomas, the Dominican Republic and Haiti. As the AP reports, health inspectors suspect a norovirus (it's actually a whole family of unpleasant bugs) as the cause of the outbreak. But confirmation awaits lab results. It's the same virus that was blamed for sickening 679 people on a Carnival Lines ship in 2006. Noroviruses have been the culprit on the vast majority of the cruise-ship outbreaks monitored by the Centers for Disease Control under its Vessel Sanitation Program. They are highly contagious gastrointestinal illnesses that cause inflammation of the stomach and large intestines. There are a number of unpleasant symptoms. "Back on dry land, noroviruses also have a big impact on people's health. The CDC estimates that noroviruses are responsible for more than half of all food-borne disease outbreaks each year. And noroviruses are the most common cause of diarrhea in adults and the second most common cause in children." "The industrial-size servings of food on a cruise ship with hundreds of passengers can be particularly worrisome, since once the virus enters the food it can spread rapidly. Food can also get more easily contaminated with the virus if it sits out for several hours, as is often the case with buffet-style meals." The CDC says there have been 56 gastrointestinal outbreaks on cruise ships in the past five years. That might sound like a lot, but in fact, Nat Geo says, it's not any more than in the 1990s or 2000s. As we've reported before, this is hardly the first problem aboard a cruise ship in recent memory — the industry has had a streak of high-profile problems in the past few years.